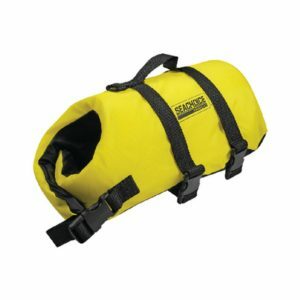 Life Jackets for Dogs and Pets… but dogs can swim, right? As a matter of fact, no. Some dogs just don’t take to the water well. Breeds with low body fat like Doberman pinschers and boxers can have trouble in the water. Older dogs may tire easily and breeds prone to hip dysphasia may have difficulty swimming. Hypothermia can be a threat to some breeds of dogs when they are unduly exposed to cold water. A pet safety vest is essential. 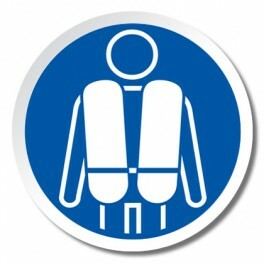 These doggy vests can be used on a lake, ocean or river. The kayaking dog vest, boating dog vest, river rafting dog vest, fishing dog vest, or canoeing dog vest are all the same pet vests. The most important feature to look for in a dog vest is the fit. Paws Aboard fit well for all types of dogs. Be sure to look for the strap handle. A good pet vest should allow you to use a boat hook if necessary to hook the grab strap and pull your dog out of the water.